We believe it’s the attention to detail and the personal touch which has given us such a great reputation as reviews like these prove. Laser Tag is similar to paintballing except it uses infra-red technology to register hits on your enemy rather than an actual projectile. We have invested in the very latest technology to bring you compact pistols and rifles that are designed for anyone aged 6+. They have an effective range of over 200 meters, keep you informed of how much ammunition you have and how many lives you have left. When someone is ‘shot’ the gun omits a loud ‘arrrrrrgghh’ ! Our Mini Paintball days for 8-10 year olds make excellent birthday paintballing parties and school trips. From the timid to the brave-hearted, everyone can enjoy a day at Cobham. With the help of our friendly instructors, children will build in confidence and learn to work and communicate with others – all whilst having fun in the fresh air of our beautiful 100 acre forest, south west of London. Mini-Paintball takes place most Saturdays and Sundays and on special dates during the school holidays. Summer evenings can also be booked for private parties. Bedlam Paintball Cobham. The best paintballing deals in Cobham. 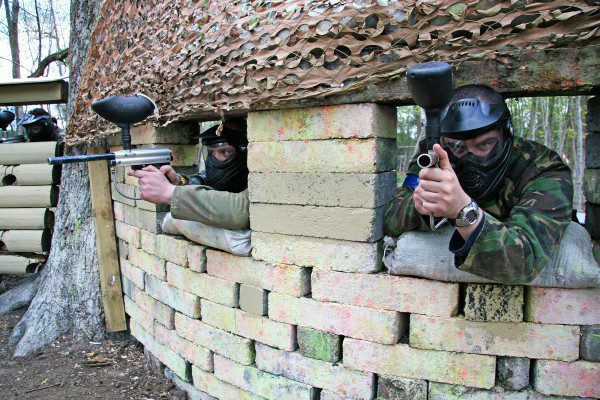 Go Bedlam Paintballing Cobham is a pay as you go package to play paintball in Cobham . The package includes entrance fees, game fees, paintball insurance, paintball marker gun, paintball hopper and propellant for the whole day.